Alfie Boe is to make a guest appearance in ITV'sseries two of Mr Selfridge. He will appear as Richard Chapman, a tenor and old friend of Lady Mae Loxley (Katherine Kelly), who once topped the bill at the Gaiety. She describes him as having "the voice and heart of an angel" and asks him to sing at a Selfridge's charity concert to raise money for the war effort, bringing him back into her life at a time when she needs him most. 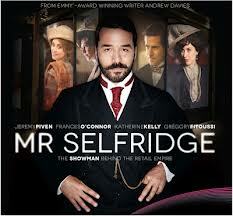 Alfie Boe said: "I'm a huge fan of Mr Selfridge and am thrilled to have the opportunity to be a part of the series. I'm looking forward to seeing the set and meeting the cast." Series two is set five years ahead in 1914 with the country on the brink of war as the store celebrates its 5th anniversary. While Mrs Selfridge (Frances O'Connor) is living a separate life to her husband, Harry (Jeremy Piven) and Lady Mae's husband Lord Loxley, has come to London to keep tabs on his wayward wife. The cast are half way through filming the series which is expected to air in 2014.